This photograph shows an exterior view of The Lewis Drug Store and other buildings on Main Street in Lewis, Kansas. The Drug Store is the third building from the right, with its sign partially visible behind a tree. 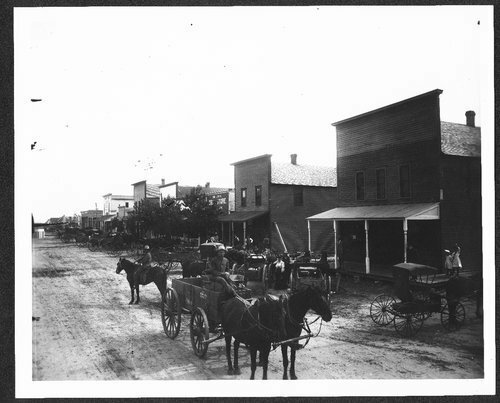 Several people are visible in front of the buildings, and many horses, carriages, and wagons are visible in the street. Holding Institution: Mrs. Merritt Beeson, 1962.